A driver has been arrested after a police chase in Barnsley, south Yorkshire. Several members of the public reported the motorist was swerving all over the roads between Rawmarsh and Worsbrough on Saturday afternoon. 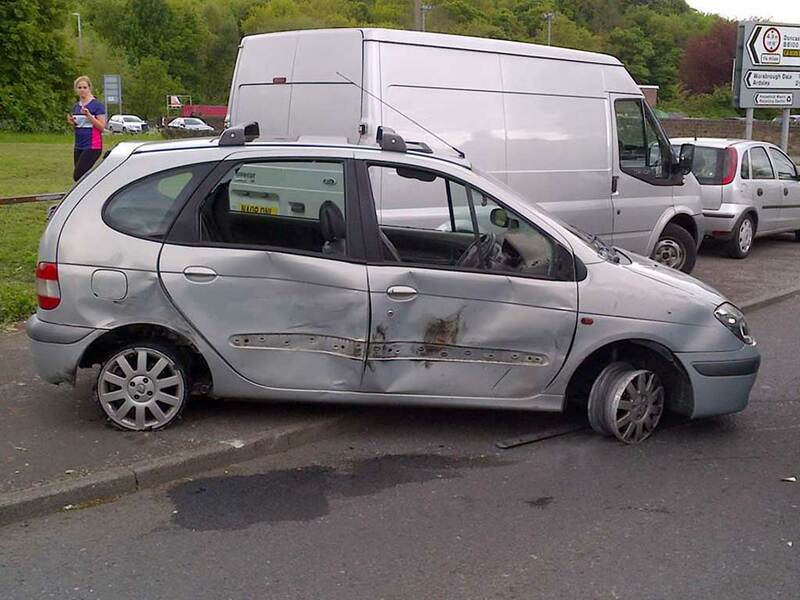 The male driver collided with several cars on his journey, both parked and moving. When police started pursuing the car near Birdwell in Barnsley it only had one tyre left on the wheels. A spokesman said: "As soon as my colleagues got behind the vehicle, it started to make off from them, using the traction available from his one tyre to accelerate to speeds of around 50mph whilst still swerving all over the road. "As the male driver entered Worsbrough, the pursuing officers took the decision that they could not let him drive any further and as soon as an opportunity presented itself, and it was safe to do so, they deliberately collided with him to make sure he could not continue his journey and continue to put everyone, including himself, at great risk." He was arrested for dangerous driving, failing to stop, drink driving and criminal damage, after spitting all over the inside of the police vehicle he was transported in. The person arrested blew 72 at the station. The legal limit is 35. The incident resulted in minor injuries to officers. And even if you get to 50 mph with the one tire--sorry, tyre--running on just rims would give you practically no braking ability. This guy won't be eligible for a driver's license again for a LONG time.